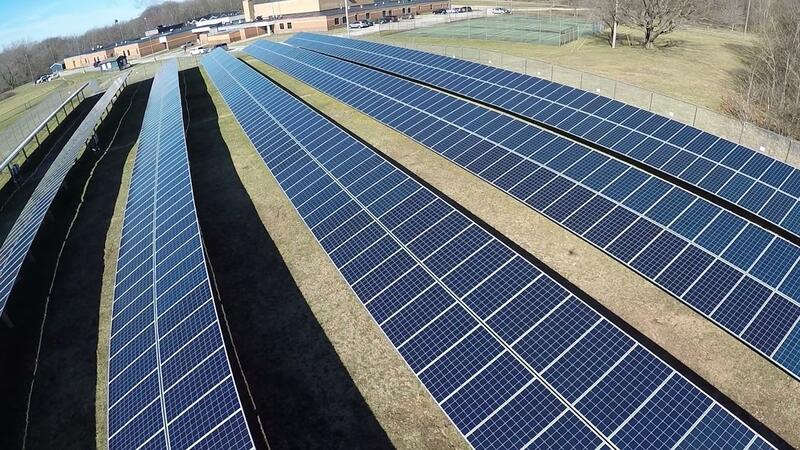 Solar array at Krueger Middle School in Michigan City. Michigan City Area Schools today celebrated the addition of new solar arrays to its facilities in a ribbon-cutting ceremony at Krueger Middle School. The recently installed ground-mount solar arrays feed into the NIPSCO power grid and the school corporation expects the new solar panels, which have been placed at seven of its 16 facilities, including the main administration building, to offset utility costs by at least 52 percent per year. That’s an annual savings of about $704,000 dollars. Dr. Barbara Eason-Watkins is the Michigan City Area Schools Superintendent. She says the money generated from the solar arrays will support about $23 million worth of capital needs in the next 30 years. Eason-Watkins says the project was welcomed by the community from the beginning. The school corporation worked with the company Performance Services to install all seven solar arrays before December 2017 to meet deadlines set by the state through a law that plans to phase out net metering by 2022. Because of the law, the Michigan City solar grids are currently set to only be operational for the next 30 years. The solar arrays will also serve an educational purpose. Students will learn about renewable energy, and resources through the National Energy Education Development Project, or NEED Project. Performance Services, who installed the solar arrays, also provided NEED training and kits to educators in the schools where the arrays would be installed.